Remember how Danny Ching blitzed an all-star field to win the Lost Mills time trial in Germany last week? Well here’s the video. 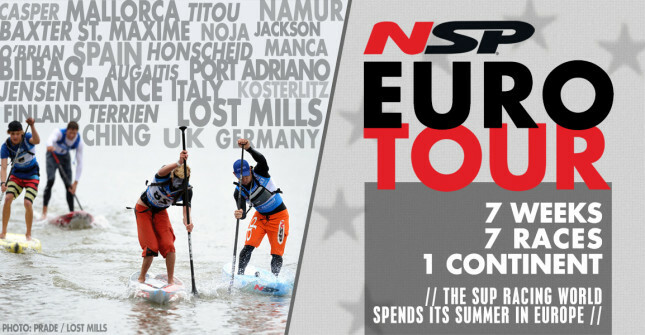 Thanks to the German SUP Mag, you can now watch Danny’s crazy performance as he sprints like a man possessed across the 200 metre “Fastest Paddler On Earth” time trial race course, setting what is surely a new world record in the process. Despite the event featuring over a dozen of the world’s fastest guys, Danny crushed the Lost Mills time trial. The 404 front man averaged over 15km/h to stop the clock at 47.60 seconds, almost three seconds ahead of defending champ Connor Baxter (who himself produced what would have probably otherwise been a record). While there are no official records in this sport, 47.60 seconds is surely the fastest ever 200 metre, flat water sprint time. 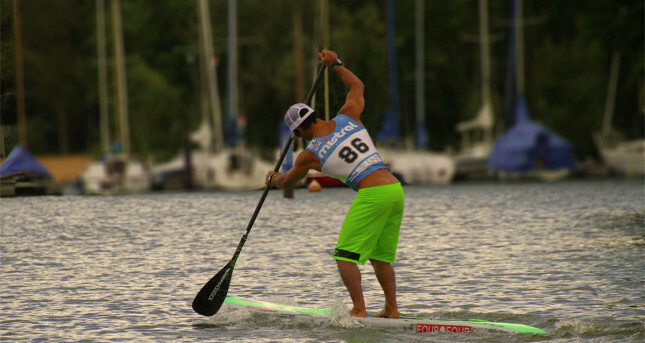 I’ve never even seen a stand up paddler break 50 seconds before this. The only caveat is that the “Fastest Paddler On Earth” uses a rolling start (the paddler takes a couple of strokes before passing through the start gate that sets off the clock), whereas most other 200m races use a standing start (the paddler isn’t moving when the clock starts). This definitely gives a slight advantage but how much is unknown (my guess would be 1 second, maybe 2 at most). Either way it’s a crazy performance and I think the video above highlights it pretty well. Danny Ching is still clearly the man to beat. – BOARD CHOICE: All competitors were using 14 footers for the time trial. Danny was using a 14′ x 24″ race board from his own company, 404. – Danny’s run clearly favours his left side, where he took 77% of his strokes. That’s interesting because outrigger paddlers (Danny’s original sport) naturally favour their left side due to the ama being on the left (the ama is that little stabilising arm attached to the side of the canoe). – A couple of those strokes were taken before the 200m gate started (the “Fastest Paddler” uses a rolling start) and maybe one was taken after. So I’d say Danny took 75 strokes during the 47 seconds. Expand that out to a full minute and he’s averaging 94 strokes-per minute. That’s a hell of a cadence.